MANILA, Philippines - The entire Philippines is now benefitting abundantly from the war against illegal drugs which President Rodrigo Duterte has declared last June 30. In less than a month since Digong took over as the top leader of the country, Filipinos are now experiencing the impact specially on security aspect. "Zumba o Kulong?" Former drug addicts prefer Zumba over imprisonment after surrendering voluntarily to the PNP. "Oplan Tokhang" or the amnesty program being offered by the PNP to all drug pushers and users has immensely downsized the crime rate nationwide particularly in Metro Manila. Thousands of drug-related offenders have voluntarily surrendered to the authority in fear of getting incarcerated or killed. But what's life like after willfully yielding to the government? In Mandaluyong City, the local government in coordination with PDEA and PNP is pleasantly guiding its strayed residents to a new and healthier beginning. Aside from amnesty, former drug users and pushers are also being given free but mandatory Zumba classes with the city cops as the instructors to divert their erstwhile ill-habits and embrace physical fitness instead for their total transformation. In Davao City, Duterte's hometown, ex-drug addicts are not only being offered free rehab but they are also being given livelihood courses and business capitals to ensure their conversion. It's so glad to see that the government, despite of its serious and sometimes bloody campaign against illegal drugs is still giving importance to the "victims" of the banned substance that shattered millions of lives worldwide. Earlier this morning, over six thousand self-confessed drug addicts and pushers from different cities and towns from Pampanga have turned themselves over to the police. 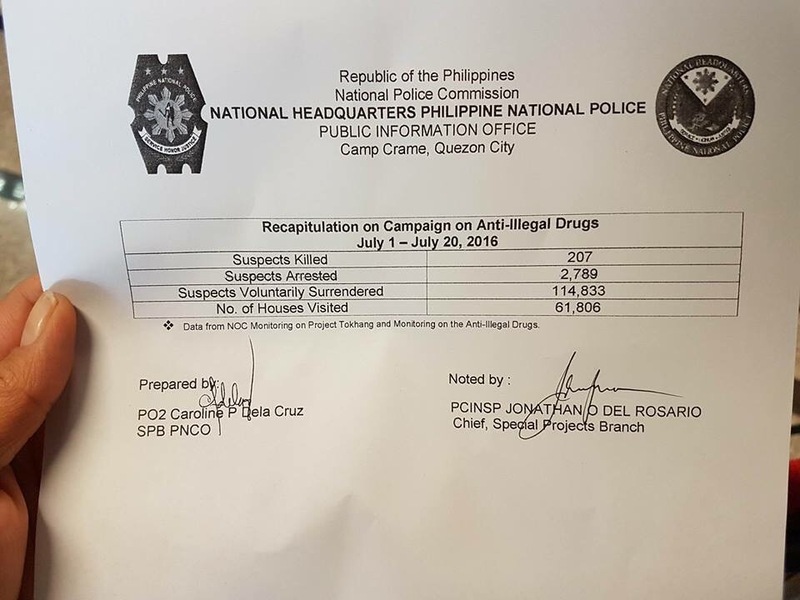 While in Camp Crame, the PNP has released an official summary report of anti illegal drugs campaign which lauded by netizens and gave the credits to President Duterte and PNP Chief Ronald "Bato" Dela Rosa. With all the incidents happening in the country, looks like Tatay Digong and Gen. Bato are on track and true to their words in wiping out the illegal drug trade in three to six months.